We take a look at the Team of the Season without naming any players from the Premier League's "big six". Let's be honest, "Team of the Season" articles almost always look exclusively at teams from the biggest clubs in the land with one or two exceptions. They often become cut and paste across several different platforms offering no real insight into the guys who are making waves at some of the smaller clubs in the division. The Pole has enjoyed a spectacular upturn in fortunes since leaving Arsenal for Swansea. The “Flapianski” moniker seems a distant memory now for the Pole who has become one of the best keepers in the league. The 33-year-old has made more saves than any other goalkeeper across Europe’s top five leagues over the last five seasons. Look past the fact that he’s only kept one clean sheet behind an awful West Ham defence. Instead, think of the position West Ham would be in had the Pole not been in goal to make a staggering 51 saves in 2018/19. The Southampton fullback remains criminally underrated and probably deserves to be playing at a team challenging for the top six. He’s played every minute of every game this season, underlining his importance in Mark Hughes’ plans. He’s brilliant going forward without shirking his defensive responsibilities. Don’t be surprised to see some of the bigger clubs in the division sniffing around come January. The big French centre-half has been a revelation this season, often getting a very slick Wolverhampton Wanderers outfit going from the back. I hate looking at stats as a means of measuring a footballer’s worth, but you simply can’t look past some of Boly’s numbers this season. 28 tackles and 46 clearances offer some insight into his defensive capabilities. The fact that he’s completed 546 passes this season and enjoyed 701 touches illustrates the fact that he’s got everything the modern centre-half needs to succeed at this level. He also comes alive in the big games, scoring in his side’s 1-1 draw with Manchester City before putting in a massive shift in another 1-1 draw with Arsenal. The Melwood graduate epitomises the spirit at Wolves under the tutelage of Nuno Espirito Santo. He was absolutely brilliant against Arsenal before the international break, playing Lacazette out of the game. His heroic block from the French striker is probably the best piece of defending you’ll see all season. He’s steady on the ball and rarely misplaces any passes. An England call-up can't be too far away 25-year-old who continues to draw plaudits from fans and pundits alike. The Crystal Palace youngster has enjoyed a stellar start to his career since being deep-ended by Roy Hodgson against Tottenham last season. He’s come on in leaps and bounds since then with some even calling for the pacy youngster to get into an England squad in the near future. The 20-year-old has everything a modern full-back needs to thrive in the Premier League. He’s outrageously quick and loves bombing forward at every opportunity. He’s not too bad defensively either, completing 45 tackles – second only to Everton’s Idrissa Gueye. The 29-year-old Senegalese has been an absolute rock in the heart of Everton's midfield. He's very much cut from the same cloth as N’Golo Kante. Gueye, however, has (statistically) been streets ahead of his Chelsea rival this season. Having played one game fewer, Gueye has completed a staggering 57 tackles to Kante's 22 and leads the way with 28 interceptions versus Kante's 10. He's been so effective in his role that Marco Silva has even done away with a second holding midfielder, electing instead to play the more attacking Andre Gomes while Gueye gets through an almost inhuman amount of defensive work. James Maddinson isn’t the only player brought in from the Championship who’s gone on to impress this season. David Brooks – a £10m acquisition from Sheffield United – has set the league alight. The 21-year-old has seamlessly slotted into the Cherries’ midfield and has already contributed three goals. The baby-faced Warrington-native is reportedly drawing interest from some of the league's bigger clubs with Tottenham allegedly monitoring the youngster's progress. Yes, he's more of a winger, but I simply can't leave him out of the XI. The little fella's reputation continues to grow as he steadily churns out consistent performances for both club and country. Nicknamed "The Scottish Messi", Fraser is blessed with pace, control and a deadly accurate right foot. He's notched three goals in the league this season and added a further six assists, and at the age of 24, the best is certainly yet to come. There were plenty of eyebrows raised at the eye-watering sum Everton parted ways with in order to prise the 21-year-old Brazilian from Watford. It proved to be an inspired piece of business for the Toffees, though. 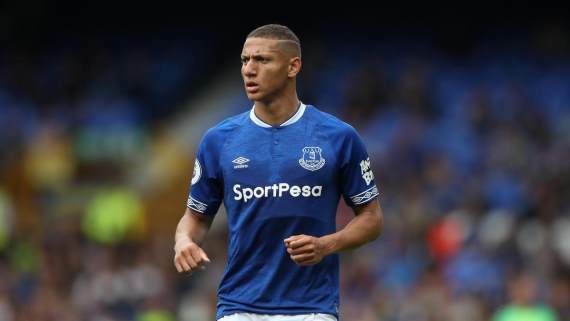 Richarlison has bagged six Premier League goals this season – a record only bettered by Sergio Aguero, Pierre-Emerick Aubameyang and Eden Hazard. He's brought welcome power and pace to Everton's attack and looks almost certain to move onto bigger things in the next few seasons. The journeyman 35-year-old – who has just been awarded a one-year extension on his contract with Brighton – has been a revelation this season. Who can forget that Messi-esque finish against Manchester Untied? He’s very much an old-school number nine who spends large periods of matches isolated up top and is asked to hold the ball up against some of the planet's best centre-halves. A goal every other game in the league isn’t bad either, especially for a player who many thought was over the hill at the start of the season. Danny Welbeck’s unfortunate injury left the England door ajar for Callum Wilson. The Bournemouth forward certainly deserves his place in the side, possibly even ahead of Welbeck who has warmed the bench for the Gunners since arriving from Manchester United. The Bournemouth man has found the back of the net six times in 12 appearances so far. Impressively, he’s also chipped in with four assists and created seven big chances for his teammates. Even more inspiring is the fact that he’s twice come back from rupturing each of his ACLs within the space of a year-and-a-half. The 40-year-old from Aversham has continually shown that he deserves a crack at a much bigger club than Bournemouth – though you won’t hear him complaining about that. Howe has performed miracles down on the South Coast and continues to defy all reason, guiding his side to sixth on the standings after 12 matches. And it’s not as if his charges are playing the sort of attritional stuff you’ve come to expect from Neil Warnock. Under his tutelage, the Cherries are blossoming into one of the best attacking units in the division. Their tally of 21 goals this season is bettered only by Manchester City, Liverpool, Chelsea and Arsenal.